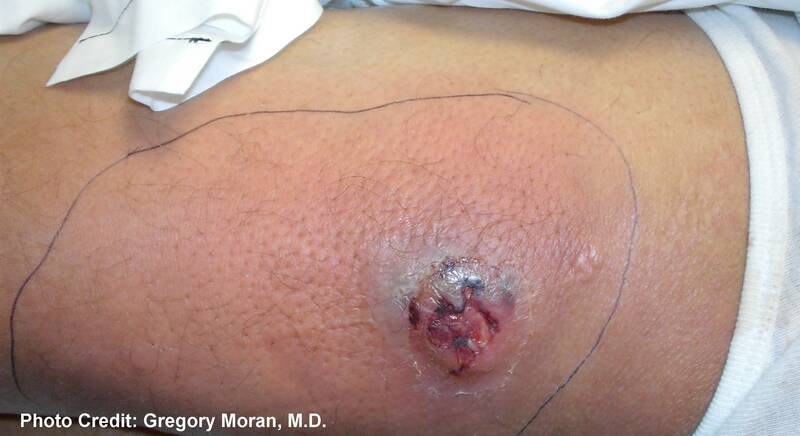 Skin and soft tissue infections caused by methicillin-resistant Staphylococcus aureus (MRSA) continue to endanger the health and lives of patients and otherwise healthy individuals. Treatment is difficult because MRSA is resistant to many antibiotics, and the infections can recur, placing family members and other close contacts at risk of infection. A study reported in the Proceedings of the National Academy of Sciences holds new hope for preventing or reducing the severity of infections caused by the "superbug" MRSA. In the study, researchers reported that a new investigational vaccine, NDV-3, employing the recombinant protein Als3, can mobilize the immune system to fight off MRSA skin infections in an experimental model. The researchers found the vaccine works by enhancing molecular and cellular immune defenses of the skin in response to MRSA and other S. aureus bacteria in disease models. The research team found the NDV-3 vaccine reduced severity and progression of skin infection in a model of the MRSA-caused disease, and prevented MRSA invasion from the skin to deeper tissues. The team said these findings support further evaluation of NDV-3 to address disease caused by S. aureus in humans, and it has already been found to be well-tolerated and capable of producing immune responses in human clinical trials similar to those observed to be effective in the present disease model. Up to one-third of patients diagnosed with invasive S. aureus infections die, accounting for more annual deaths than HIV, tuberculosis and viral hepatitis combined. A vaccine that could prevent or lessen the severity of MRSA infections would be a significant advance in patient care and public health.